As the Youth Leagues go in to their winter break I try to keep the blog ticking over with an article or two related to Rangers youths, so I am always open to suggestions for an interesting topic. The title “He Played Wae Rangers” is me quoting myself, over the years it is something I would say to my mates while watching the first team, referring to someone in the opposition’s side. These two players have been fairly significant in terms of Scottish football but few people would associate them with Rangers. Where as there are 100’s of players who have played for young Rangers sides over the years, and neither of these players signed professionally at the club, I class these two as Rangers players as both played in the Under 18 youth League and I am pretty sure the SFA Youth Cup for Rangers. I saw both of them in a Rangers jersey at least a dozen times, they pre-date Murray Park and the majority of these games were at Maryhill Juniors ground, Lochburn Park, which Rangers used on Sunday’s for their young sides, their appearances for the Under 18’s would have been at Creamery Park home of Bathgate Thistle. Rangers were pretty keen to sign them both but they opted to start their professional careers with clubs in the top tier in England. Were this to happen today Rangers would get a significant sum in compensation for development, back then the club got nothing. 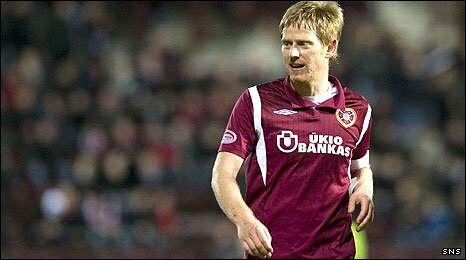 The first player is former Hearts and Hibs midfielder Michael Stewart, currently without a club since leaving Charlton Athletic in the summer. Back in 1996 he was staring in Rangers U16’s midfield and along with Celtic’s John Paul McBride he was considered among Scotland’s top talents. These two players were rivals in more sense than one, competing to be the play maker in Scotland’s youth teams as well as Old Firm rivals. Rangers tried hard to convince Michael his football future was at Ibrox, but I think his mind was made up long before his 16th birthday and he signed for Alex Ferguson at Manchester United. Although he did make the first team at Old Trafford on a few occasions, an attitude and petulant streak which I witnessed first hand when I saw him red carded for Scotland U21”s against Northern Ireland, for throwing the ball at the referee, may have been one reason his progress stalled. In 2004 it looked like he would eventually end up at Ibrox when Alex McLeish took him on the pre-season trip to Austria. When it became apparent that FA regulations required him to sign a formal loan contract in order to allow him to play in friendly matches he was sent back to Manchester. It was also pointed out that the player would need to accept a significant reduction in his weekly wage and free himself from his Old Trafford contract, which has two years to run, before he could consider making a short-term offer. Of course he then went on to play over 100 games for his boyhood heroes Hearts and over 50 games for their great rivals Hibs. While at Manchester United he gained three Scotland caps in Berti Vogts cast of thousands in 2002 and was capped once as a Hearts player in 2008 against Northern Ireland by George Burley. He is one player I think should have achieved more than he did. His rival all those years ago, John Paul McBride, never quite made the break through at Celtic and moved on to St.Johnstone. His senior career took him to Partick Thistle, Stenhousemuir and Stirling albion and he is currently turning out for Wishaw Juniors. The second player has not had quite as prominent a career as Michael Stewart but was almost as sought after as a youth player. He is due to come up against the Ibrox side when his current club Arbroath meet Rangers in the Scottish Cup. The player is midfielder Brian Kerr, I am not quite sure if he played in the same youth side as Michael Stewart but they were certainly around the same time. If the blog had existed back then I would have had a record of the lineups rather than trying to rely on my memory. I remember Brian as a wide right player, with occasional appearances in centre midfield. Again Rangers were keen to retain him as a professional but he opted to sign for Newcastle United. Like Michael he did make the break through but failed to establish himself as a regular and he returned to Scotland to sign for his home town club Motherwell. A cruciate injury in a pre-season friendly put his career on hold, but recovered to become an established player in the Motherwell side. 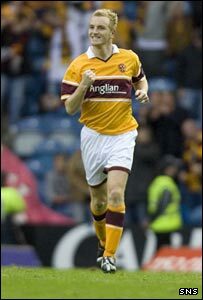 Out of contract in 2007 he made what looked like a good move at the time to Hibs, in hindsight a new deal at Motherwell may have been the better option. A change of manager at Easter Road meant he soon dropped out of favour and after short spells at Inverness CT and Dundee he signed for Arbroath in 2011. And it’s not only Rangers that links these two players, that man Berti Vogts again, Brian gained three Scotland caps all as a substitute under Berti on 2003 /2004 season. With the youth leagues about to go into cold storage I managed to get my fix of youth football this week by taking in the Under 14’s game against St.Mirren at Murray Park. The young Rangers side got revenge after their recent defeat to the Paisley side, although two late goals from the visitors almost pegged them back. St. Mirren were first to threaten after five minutes with a break down the left, Robbie McCrorie came out of his box, the Saints attacker evaded him but from wide-angle his effort went harmlessly across goal. Three minutes later only a fine save prevented Rangers taking the lead, a move involving Greg Taylor, Ross Lyon and John Cunningham saw the later denied by a save at point-blank range from the Saints keeper. Rangers Trialist Stuart ????? then latched on to a poor pass back and rounded the keeper, but the stopper had done enough to force him wide of goal and the ball ran out for a goal kick. The visitors then took the lead with a fine move down the right and when the ball was played across goal the striker netted from close range. Rangers were back on level terms four minutes later, Greg Taylor was fouled out on the left touchline and when Josh Jeffries sent the free-kick into the box Jamie Barjonas was on hand to head past the keeper. The visitors then had a couple of chances before the end of the first period, the first came from an attack down the left but the shot was dragged across goa and widel. Their striker then found himself through on goal and he tried to chip Robbie McCrorie but the Rangers keeper stretched to save. Five minutes into the second period Rangers took the lead, a great run into the box from the right from Jamie Barjonas took him past two defenders to sent up a chance for Greg Taylor with the keeper diverting his shot wide with his legs. Greg Taylor swung over the corner from the right and Jason Krones rose to head into the net. Five minutes later Rangers had their keeper to thank for keeping their lead intact, from a break down the right and cutback into the box Robbie McCrorie blocked at point-blank range with his legs. Rangers then hit St.Mirren with two goals in as many minutes midway through the second period, Josh Jeffries sent in a corner from the left and Ross McCrorie’s header looked netbound with John Cunningham well placed to just make sure with a close range header. Josh Jeffries then split the defence with a superb pass to John Cunningham in the inside left channel, the striker took a touch before sending an unstoppable shot high into the net from just inside the box. St. Mirren were given a chance to get back into the game when they were awarded a penalty with around nine minutes left which they duly converted. With a couple of minutes left they reduced the deficit further with an attack on the right hand side of the box and a superb strike that found the net despite Robbie McCrorie getting a touch. Rangers went straight to the other end and Josh Jeffries broke forward from midfield, he cut inside the defender at the edge of the box and fired a shot off the keeper’s left hand post and along the line before being cleared. Saints had one final chance with an attack down the left with keeper Robbie McCrorie parrying the shot. Rangers Squad:- Robbie McCrorie (GK), Ross McCrorie, Lewis White, Jason Krones, Reagan Milne, Jamie Barjonas, Stuart ???? ?, Ross Lyon, John Cunningham, Greg Taylor, Josh Jeffries, Gary McGreish, Jamie Brandon, Peter ????? Footnote:- In an earlier kick-off Rangers 13’s beat their St.Mirren counterparts 3-0. It was Falkirk who had the first chance of the match after six minutes when they broke into the right hand side of the box and the trialist keeper in the Rangers goal stood tall to make the block. Two minutes later at the other end Scott Roberts corner from the right found the head of Craig Halkett and the keeper made a fine save diving to his right. Five minutes later a good passing move involving Tom Walsh and Dylan Dykes setup a chance for Danny Stoney who was denied by a superb block from the central defender to divert the ball wide. Rangers then took the lead after seventeen minutes, superb play on the right from Scott Roberts saw him take on the full-back and hit the byline, his cutback was fired into the net from close range by Danny Stoney. Six minutes later it was goalscorer Stoney the got to the byline on the right and a combination of keeper and defender just prevented Charlie Telfer from converting. Four minutes later the visitors created a chance cutting inside from the left flank and Craig Halkett had to make a superb block to clear the danger. A minute later Stoney was quick onto a ball over the top and as he tried to round the keeper he was denied by a brave save at his feet. With just over ten minutes to the break Dylan Dykes tried his luck from a twenty-yard free-kick which the Falkirk keeper turned round his left hand post. Three minutes later a corner from the right gave the Rangers defence problems but the central defender up for the corner knocked the ball over at the back post. Just before the interval the Trialist keeper in the Rangers goal was almost caught out from a long-range effort but managed to react and kick the ball clear. The home side was first to threaten after the break, Jamie Mills cut in from the left and passed to Danny Stoney inside the box but the Rangers striker’s shot was wide of the keeper’s left hand post. Falkirk grabbed an equaliser on the hour, the replacement Trialist keeper came for a corner from the right only to be beaten to it by a Falkirk player who headed into the net. Eight minutes later Rangers had a great chance to take the lead, Luke Hammond sent Charlie Telfer clear and as he rounded the keeper he was brought down for a clear penalty, Telfer stepped up to take the kick but saw the keeper dive to his right to make a fine save. The keeper then had a comfortable save five minutes later from a long range shot from Scott Lochrie. The last real chance of the match came sixty-seconds later, Kjeld McIntyre picked up a slack pass in midfield, broke towards the box before setting up Tom Walsh with the keeper blocking his shot with his legs. Rangers Trialist No.1 (Trialist No.21 46mins); Ryan Sinnamon, Greg Pascazio, Craig Halkett, Jamie Mills (Ross Kellock 68mins); Scott Roberts (Kjeld McIntyre 68mins), Dylan Dykes (Scott Lochrie 65mins), Kris Gibson, Tom Walsh; Charlie Telfer, Danny Stoney (Luke Hammond 58mins). Footnote:- At the same time Rangers 13’s and their Falkirk counterparts played out a goalless draw. On Saturday Rangers 19’s took on St.Johnstone at Murray Park, as already mentioned the 1pm kick off meant I was unable to attend. Goals from Kyle McAusland, Darren Ramsay, Callum Gallagher (Pen) and Matty Clarke along with a penalty save from Alan Smith saw them run out 4-1 winners.